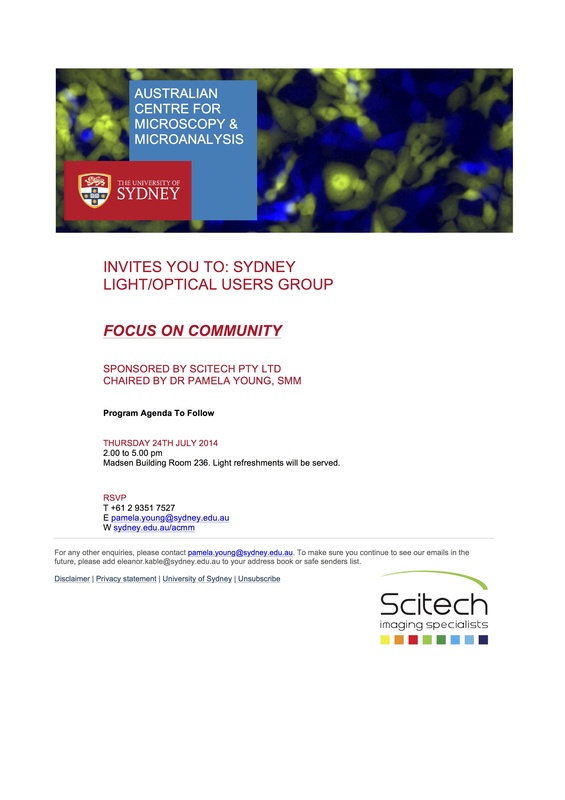 Here is a recent talk I gave to some members of the public at the Garvan Institute of Medical Research. It is a very general and simple over-view of explaining 1) how cells in your body proliferate, 2) how this goes wrong in cancer, 3) the challenges we are facing in treating and killing cancer, and 4) most importantly how we hoping to improve current treatments in the near future. A big thanks to all the fantastic Garvan Foundation Team who hosted, filmed, and edited the event. This entry was posted in Info, News and tagged Cancer, Cell cycle, cell division, chromosome bridge, Confocal, Garvan, Garvan Foundation Team, Garvan Institute of Medical Research, Kinghorn Cancer Center, microscope, Mitosis. 2014 Garvan Cancer Division PhD Open Day, 10th September ! Are you interested in Cancer Research and want to do a PhD at the Garvan? Then come along to the open day and where you can meet with all the supervisors, discover some amazing projects, and get all the information you need to start your career in Cancer Research. Registration is free but limited to the first 25 registrants, and closes at 4.00 pm on Tuesday, 09th Sep 2014. For more information and to register for the day, please visit the website [link] or contact Dr Alessandra Bray. This entry was posted in Info, News and tagged cancer research, Dr Alessandra Bray, Garvan, Garvan Institute of Medical Research, Kinghorn Cancer Center, Kinghorn Cancer Centre, open day, PhD. UPDATE: ImpactStory is not free, as I first thought, they currently have a 30 day free trail, then the cost is $45/year. Its clear that judging a researchers output purely on the impact/quality of the journal they do/don’t publish is not always the best way to accurately judge individual achievement and output. To that end, article level metrics have recently emerged as a potential way to generate a more accurate picture of a individual researchers output. I hadn’t really taken much notice of article metrics, however a friend at work recently told me about Impactstory, a new website that is…. Its very quick and easy to signup and quickly get a snapshot of your article specific metrics. You can see my results here [link]. Interestingly, my PlosOne paper is ranked 3rd, above the 4th placed EMBO publication, which according to the traditional Impact Factor measurement would be viewed as a much, much, much better publication. 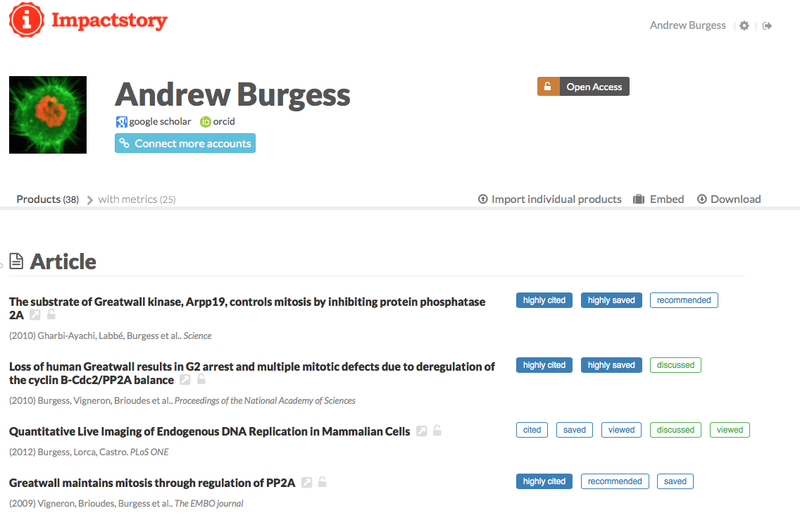 Another player in this space is ResearchGate, which has been around for much longer. It gives you a RG score, which “takes all your research and turns it into a source of reputation”. How does the RG Score work? 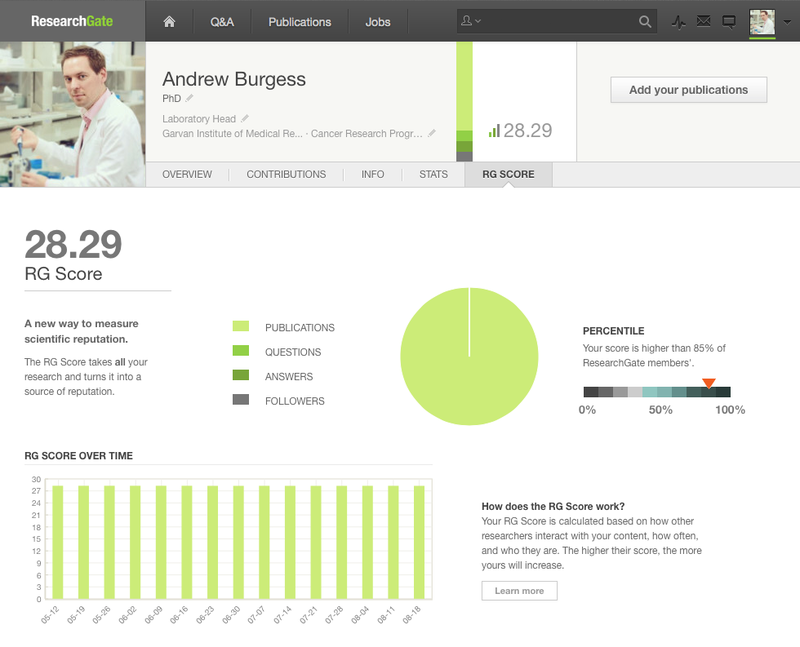 Your RG Score is calculated based on how other researchers interact with your content, how often, and who they are. The higher their score, the more yours will increase. Its going to be very interesting to see how these new metrics impact on the judging of individual scientists output, and if, when and which metric grant funding bodies will prefer. This entry was posted in Info and tagged altmetrics, article level metrics, Garvan, IF, impact factor, Impactstory, individual achievement, metrics, Researchgate, scientific impact, SJR. Great news, there is a new Electronic Lab Notebook (ELN) out on the market, and is originates in part from the makers of the excellent Papers App. Its still very much beta software, but the roadmap looks promising. Based on my limited testing so far the program seems very easy to use, an not as overly complicated as some of the other ELN out there, which I have often found overkill for my personal needs, and consequently too expensive. The bit I like the most is that the software does not depend on a server, and thus if the developers go bust, you still have the software, and your ELN. Perhaps the best bit so far is the price which is only $29 AUD, very reasonable, and thankfully no ongoing yearly subscription fees. Looking forward to trying this out more over the next 6 months. This entry was posted in Info and tagged Alexander Griekspoor, electronic notebook, ELN, experiments, findings, lab records, mekentosj, Papers App, protocols, software. 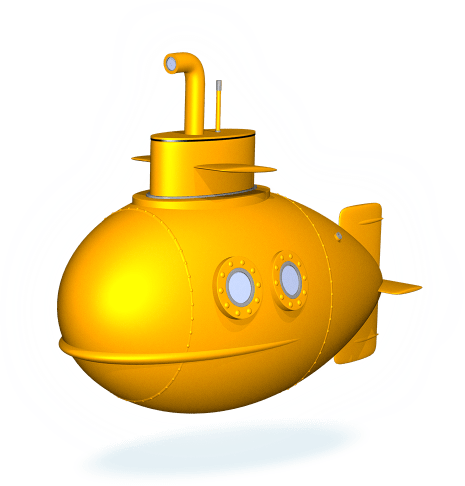 Anti-Oxaidants and Cancer…A complicated story! There has been a bit of press lately suggesting that Antioxidants might actually be bad for cancer… not good as they are commonly promoted in the media. IFLS has put together a great article on some of the reasons why antioxidants might not be such a great thing [Link]. 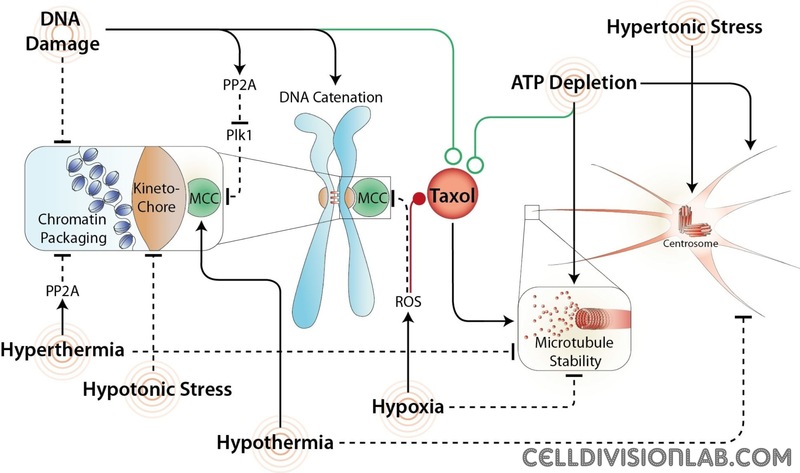 In addition, we recently wrote a review article about how different ‘stresses’ including oxidation can affect mitosis, and cancer. We also came to a similar conclusion in our review, that antioxidants were a complicated and not always benifical for treating cancer. One of the main reason we suggested this was due to the fact that many common antioxidants are part of the Flavonoid family. On the surface that sound great, but many Flavonoids also happen to potently inhibit cyclin dependent kinases (Cdks). Coincidentally, our other recent article in Cell Cycle, showed that partial inhibition of Cdk1 can dramatically disrupt mitosis and drive severe cytokinesis defects and polyploidy (see video below). 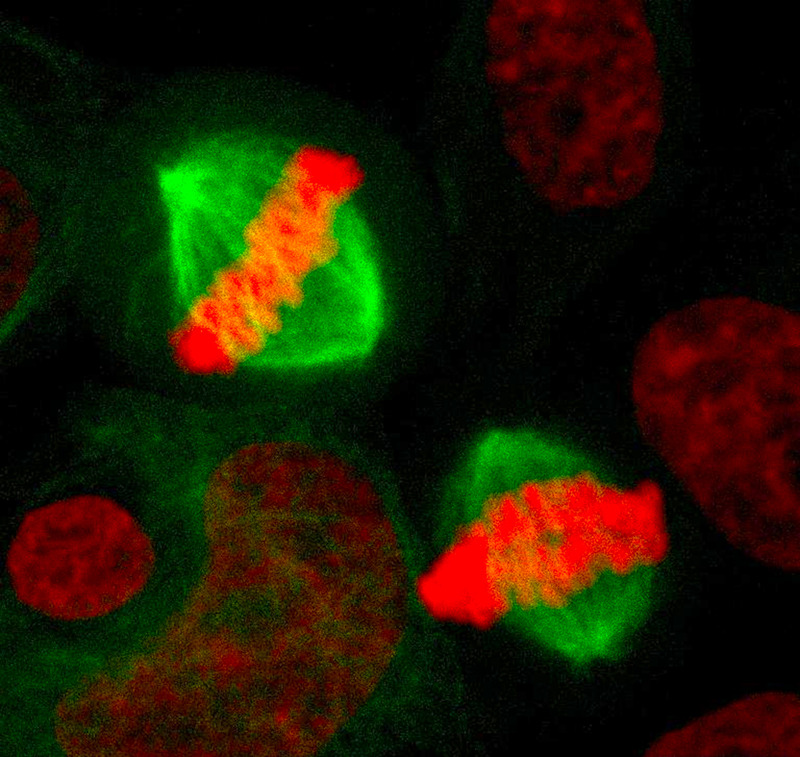 These mitotic defects are the foundation of chromosome instability (CIN), which is a hallmark of more aggressive cancer types, that are also resistant to most chemotherapies and treatments. In simple terms, there is a possibility that in some cases, taking large quantities of dietary Flavonoids (e.g red wine, dark chocolate etc) could drive the formation of more aggressive cancers. This is definitely an area that needs a lot more research, and as always make sure that you fully discuss any dietary and supplements with your oncologist. This is what happens when a ‘fairly normal’ cancer cell is treated with low doses of a Cdk1 inhibitor. 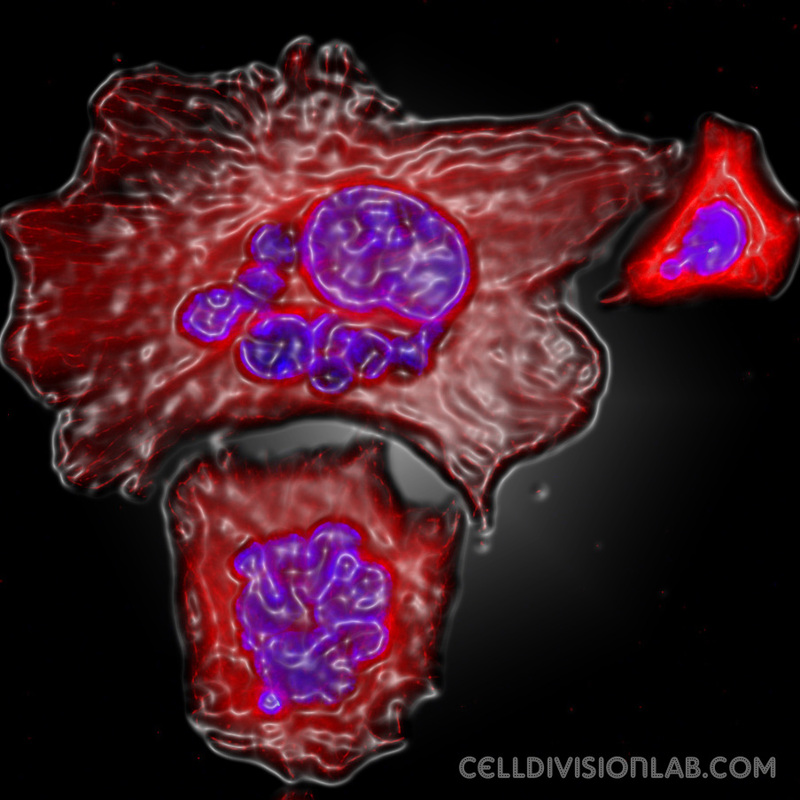 Here is a picture of a polyploid cancer cell, which was produced by partially inhibiting Cdk1. This entry was posted in Info and tagged aneuploidy, antioxidants, Cancer, Cdk1, Cell cycle, cell division, chocolate, chromosome bridge, CIN, cytokinesis, Flavonoid, Garvan, Kinghorn Cancer Center, Mitosis, wine. 3 New Amazing Biomedical Animations by VIZBIplus ! In a follow-up to the post I made a week or so ago on the amazing “Cancer is not one disease video“, there are now an additional 2 stunning videos from the very talented people from VIZBIplus covering the The Hungry Microbiome and Inflammation & Type 2 Diabetes. This entry was posted in Info, News and tagged CSRIO, Diabetes, Drew Berry, Garvan, Kate Patterson, Kinghorn Cancer Center, Making Science Beautiful, Microbiome, Vizbi, VIZBIplus, Walter & Eliza Hall. Want to win a very cool Wacom Cintiq 13HD! Got some amazing Science Artwork you want to show off? Then why not enter the VizbiPlus Challenge ! ‘VizbiPlus: Visualising the Future of Biomedicine’ is a new project funded by the Inspiring Australia government initiative, the Garvan Institute of Medical Research, the Walter & Eliza Hall Institute, and CSIRO. Its goal is to train three scientists to create scientifically accurate 3D animations that explain the latest biomedical research in a way that inspires and engages the general public, and then present this work in public events to maximise the reach of the work. This entry was posted in Info and tagged CSRIO, Drew Berry, Garvan, Kate Patterson, Making Science Beautiful, Sean O’Donoghue, Vivid Ideas, Vizbi, Wacom Cintiq 13HD, Walter & Eliza Hall.